SuperPhillip Central's final review of January is for a game that released late last year. It's Dragon Ball Fusions, and if you're looking for a different kind of Dragon Ball game that is quite good, then Fusions will deliver for you! Here's my review. Dragon Ball Z is one of the most popular anime in the West for a good reason. It's very easy to get into, the characters are likable and have grown over the years, and the action is amazing. Meanwhile, the games over the years haven't been the most consistent. Compared to the early years of Dragon Ball video games, we're in a special time thanks to Namco Bandai's efforts, such as its most recent Dragon Ball Xenoverse duo of fighters. Now, the company has delivered a unique title to the Nintendo 3DS in Dragon Ball Fusions. 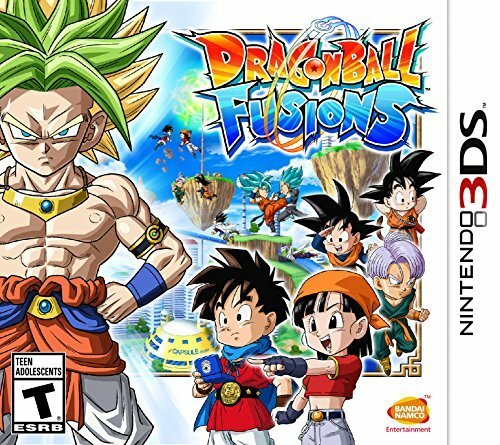 While more of a fast-paced RPG than a fighter, Fusions offers plenty of playtime and strategy for those Nintendo 3DS owners who crave it. Dragon Ball Fusions begins with you creating a custom avatar based on five races; Earthling, Saiyan, Namekian, Offworlder, or Alien. Each race possesses its own strengths and weaknesses, but most will probably just choose the race that appeals to them best aesthetically. From there, the choice of facial features, hairstyle, and voice are available to tinkered with, though each feature is modeled after a particular character in the game. Dragon Ball games usually have told the tale of the series and its various sagas ad infinitum by this point, so it's quite refreshing that Dragon Ball Fusions goes a different road. It starts off with you and your friendly rival Pinich having all seven Dragon Balls in your collection. Your joint wish is to hold a special fighting tournament to determine the ultimate warrior. This pulls both you and Pinich into an alternate world where the tournament is set to take place. Story progression is made by flying around the open world maps of Fusions, talking to NPCs and performing various tasks and objectives for them. As you complete these tasks, new events are available and new combatants join your ranks. Characters in Fusions are from the entirety of the Dragon Ball mythos, including the original Dragon Ball, Dragon Ball Z, Dragon Ball GT, Dragon Ball Super, and many of the movies in between. The Great Saiyaman is one of countless Dragon Ball heroes available to recruit. However, the usual means to have new combatants to join your side is to recruit them in battle, which can be quite the annoyance for more notable and rarer characters. The majority of recruit-able characters in Dragon Ball Fusions are generic fighters based on the various races in the game and not big names like Goku or Frieza. Regardless of who the character is, through, to recruit them in battle, that character must not only have a star next to its name on the bottom screen, but you must take them out with a Zenkai Attack, a special attack in Fusions that uses energy in a meter that grows from performing and taking damage from Ki-based attacks. Even then, it's not always 100% that a defeated enemy will automatically be recruited, especially for the stronger fighters in the game. There's quite a bit of luck involved. Recruiting opponents isn't just used to gain a strong stable of fighters. Each race has a particular type of energy assigned to it, and many story barriers in the game require you to have a specific amount of energy available to open them. Recruiting fighters of different races increases the amount of that energy you can collect, and fighting and beating opponents of a certain race earns energy. This energy requirement to open barriers to new areas of Dragon Ball Fusions can be an annoying roadblock for many players. Battles in general take place in an arena setting and play like a turn-based RPG of sorts. Each fighter's icon is shown on a timeline, slowly inching their way to the right side, giving them a turn once it reaches that destination. During their turn, they can perform one of a myriad of actions, performing a melee attack that can be blocked by the opponent, a Ki attack that can't be dodged but does less damage, or a special attack that are energy-based like Kamehameha or melee-based like the Power Pole Extension if they have enough Ki orbs to use them. Depending on the turn timeline, if the next fighter or even fighters in the turn order are on the same team as the attacker, they will get some early attacks in one the unfortunate target. Arenas such as this one are where battles in Dragon Ball Fusions happen. Like I said, melee-based attacks can be guarded against, and this is possible through a mini-game of sorts where the attacker selects a direction to hit the opponent in and the defender selecting a direction as well in hopes of correctly guessing the attacker's intended direction. If they are correct, then the damage is minimized and the knock-back isn't as severe. When I say knock-back, I mean that several types of attacks can launch an opponent backwards, either into their own teammates to deal damage to them or into your teammates who will attack them for some extra damage. C'mon now, where's your sense of sportsmanship? The length of a given battle can greatly vary depending on the strength of your foes. Some battles can last as quickly as one minute against a group of throwaway foes while a battle against a powerful group of enemies can take upwards of ten minutes. A big part of this is being forced to watch the attack animations of every move, with no option to skip these. Repeatedly seeing the same animations can grow old, but thankfully, the majority of them are less than ten seconds. Winning these battles earns each active teammate experience points as well as the occasional new move for defeating an opponent through simultaneously K.O.-ing them and hitting them out of the ring. Each fighter can only hold three moves at a time with an option to hold 30 moves as a backup for all fighters. The "Fusions" part of Dragon Ball Fusions is a major mechanic of the game. Literally every character, even the generic ones, can fuse with one or several specific characters, pending they have met the requirements to do so. There are standard ones like Gohan and Trunks turning into Gotenks, but there are more humorous ones like Tien and Yamcha combining into one to form a being that is more powerful than Yamcha will ever be. There is also the ability to perform a five-way fusion in battle through the same means as doing a Zenkai attack (i.e. having enough energy in your team's special gauge). This temporary form allows you to enter a real time battle where you attempt to attack the enemy as much as possible while they try to attack you to lessen the amount of time you have in the fusion. Once time is up, a big blast occurs, dealing significant damage on top of the hurt you've already laid into your target(s). Perform a five way fusion to turn the tide of battle... or put victory out of reach for the other team. Visually, Dragon Ball Fusions shows that the aging Nintendo 3DS still can produce some very impressive graphics. The chibi models are the standouts in the visual department, as are the detailed backgrounds, all adding up to limited slowdown. It's a demanding game on the 3DS, as evident by the total lack of stereoscopic 3D. All of the voice work is left in Japanese, but most of the dialogue isn't voice anyway, just "Hai"-s and short voice clips of that sort. The music is typical of the Dragon Ball series with lots of rock and uptempo tunes. Dragon Ball Fusions continues Namco Bandai's successes with the Dragon Ball license that it recently started with the Xenoverse line of games. Battles are strategic and engaging, collecting an assortment of fighters of all types is enjoyable (though the luck required to recruit some of them is ridiculous), and the original story is a good one for fans of the series to once again revisit their favorite characters. The repeated need to see battle animations and the requirement to collect enough energy to progress in the story can both be obnoxious things to contend with, but overall, Dragon Ball Fusions nails its fusion of turn-based RPG gameplay and high octane action.